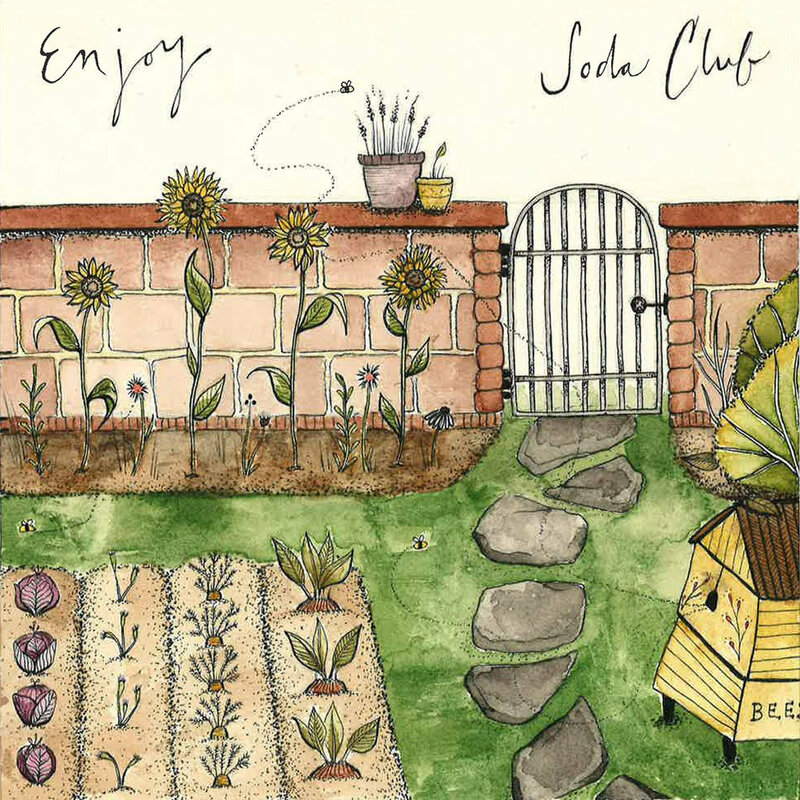 I have been following the Pittsburgh-based Soda Club since they started. I thought the name and look were so cool and twee. Somehow, I have never seen them live, though I have planned to go to quite a few shows that somehow my presence never materialized at. They just released an EP, Enjoy, on February 2nd. "Oh that could be cool," I thought. And here is my review. The album cover of Enjoy is a little pencil drawing of a garden with vegetables and bees as mentioned in one of the EP's tracks. It's a little cutesy, and something seems off with the perspective on the top of the wall. I really like the linework and watercolor though. I feel like this would look pretty good in reality, particularly on a 7" record. Enjoy starts out with "Halloween Party", a slow, doo-wop song that recalls older Pittsburgh janglers Actual Size. It's more melodic and soft than that though. I love the saxophone on here, and the drums sound very nice. The band goes quiet and comes back with a Clarence Clemons solo. The lyrics make me sad a bit. "Been Down" starts slow with downer lyrics, but the speed picks up with the words. This song was really cute. It made me feel better about myself actually. I love this line - "If you wanna be a beekeeper, I will help you keep those bees." "Stone Soup" has a romantic sound, a tale of life as a paper poem. It has a dark edge to it in a way, "Our laughter, then silence, followed by tears and violence." To me, it sounds like it's about accepting that the world changes and people come and go; things change from bad to good. The end has a back and forth segment between the two vocalists. The final track is titled "Haunter". It is a very stark, slow tune of slight peril. It gets faster at the end with lyrics about just living for the moment and, unfortunately, not living for yrself. It was nice to finally hear Soda Club. The musick was overall what I expected, lyrics that are both sad and joyous with various twists. The songs seem more poetic than the standard rock fare and have a very nice lyrical composition. I like the simple instrumentation - even a ukelele sounds pretty good here! At just four songs, Enjoy is a compact listen; I get the feeling it would get drawn out if it continued like this for much longer. As it is, Enjoy receives a Good.